This workbook is designed to help you plan and enjoy the rest of your life. You will get clear about your values, empower your vision, and identify your life purpose so you know what you came here to do. Then you’ll set goals and develop a concrete action plan with timelines to actualize your destiny. You’ll clarify the next steps in your business or career with strategic planning. This course has been compiled from years of coaching clients and group participants to find their passion and express it more fully in life and work. Nina’s mission is to assist people in doing what they love, finding balance between work and play, and enjoying life more. 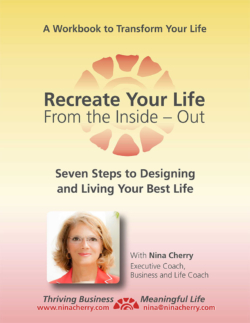 The RECREATE workbook PDF is $17.00 (US). Nina offers an UNCONDITIONAL GUARANTEE, so there is no risk!